Are you moving to Grapevine soon? 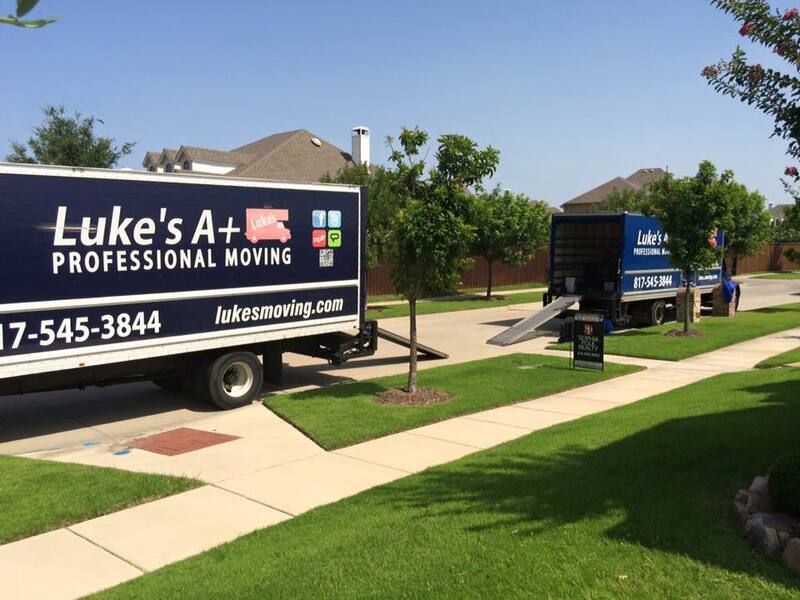 Moving can be quite the process, but there’s no need for added stress when you have Luke’s A+ Professional Moving on your side. Grapevine, a suburb of Dallas and city of Tarrant County, is known for its restored 19th and 20th-century buildings located near Main Street in the historic area. The city caters to tourists as it nestles up against the DFW airport, and the TexRail stops in downtown. Luke’s A+ Professional Moving is a company that has the best qualities of both national and locally owned movers. We’re your best choice and the perfect Grapevine moving company. We’ve been up and operating in and around Grapevine for more than five years now, and our business continues to grow one satisfied customer at a time. We have the experience you can count on in a Grapevine moving company, and we want you to see that experience in action firsthand! Luke’s A+ Moving Company’s movers are friendly, experienced, and know how to get the job done right the first time and on time. Our well-maintained moving equipment is perfect for all types of Grapevine moves. And our team of moving trucks is the largest in the Dallas Fort Worth Metroplex. Contact our full-service moving company in Grapevine, Texas, to prepare for your upcoming move. If you have a gun safe we’ll attach it to an appliance dolly, which is rated to hold thousands of pounds, and get it moved and stored properly. We’ll get everything done for you so that the day of the actual move is as stress-free as possible. Grapevine has just over 46,000 people and is just 22 miles from downtown Dallas. Grapevine is one suburb of Dallas that’s been expanding rapidly in recent years. More and more families are finding the area great for raising a family outside of the busier Dallas Fort Worth Metro Area. In 2012, CNN/Money Magazine voted Grapevine as one of its “Best Places to Live” in America. The city caters to tourists visiting the Dallas Fort Worth Metro Area, mainly because the Dallas Fort Worth International Airport is in the suburb. Grapevine Mills Mall is a perfect place to wile away the days shopping and dining. The Main Street historic district downtown is also another place for sightseeing and finding those perfect gifts. There are also plenty of wineries in the area, thanks to the Texas Wine and Grape Growers Association. In 1843, General Sam Houston and his Republic of Texas Commissioners camped at Grape Vine Springs to meet with the leaders of ten Indian nations. They met to sign a treaty opening the area for homesteaders. The settlement was named Grape Vine due to its location Grape Vine Prairie near Grape Vine Springs, both of which named for the wild grapes that grew in the region. The town also pays homage to its namesake: wine. Wineries, wine accessories, and wine stores can be found not only along Main Street but throughout the entire city. Not just wine, but shops, eateries, and art galleries lure prospective home buyers to call Grapevine home. In September, Grapefest Wine Tasting Festival takes over Main Street. This four day event brings in world-class food, entertainment, and venues for all to enjoy. And in May, Main Street Festival comes to town where adults can enjoy beer tasting, kids can enjoy carnival rides, and everyone can enjoy food. Lake Grapevine, a large reservoir impounded by the Army Corps of Engineers, serves as a great place for fun with kayaking, jet skiing, and fishing. If you want to stay indoors, Great Wolf Lodge makes a great getaway for the kids. Grapevine Mills Mall, the 1888 Cotton Belt Railway, the Gaylord, and a plethora of restaurants, coffee shops, and stores are all great attractions that Grapevine has to offer.